As many of you know, I began Lent in our partner dioceses in India. It was wonderful to begin Ash Wednesday in the early morning in the cathedral at Dornakal. This was followed by breakfast – And one of the challenges in India is eating only with your right hand – it was often pretty messy – and it was particularly nice on those occasions when a bowl with warm water and lemon appeared so that we could cleanse our hands. 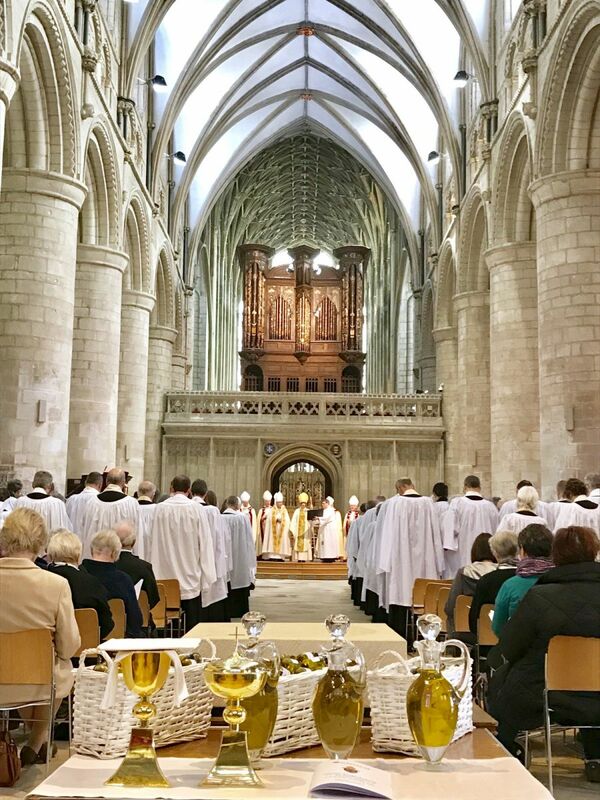 It reminded me of my consecration when the Archbishop of Canterbury was presented with an enormous bowl of warm water and lemon after he had anointed my head and poured copious amounts of oil of chrism over my hands. Our gospel reading was full of mess with oil: A woman pouring oil over Jesus’ feet, but first we have her wet tears and wiping her hair on Jesus’ feet. All quite messy but all in a place of relationship and encounter with God. Today we are praying over the oils which will be used during the year but there’s been a bit of a change in how you will collect that oil. To try and make it less time-consuming and less messy, the oil is already in small bottles for you to take away. Although I confess that as I was preparing for this sermon, I began to wonder about the change because I don’t want us to lose some of the lived metaphor which is possibly present in the oily mess which has emerged in past years as people have crowded around the oil after the service to fill different shaped containers. This oil which we take away to use in our ministry will be used amidst the messy brokenness of life: The oil for baptism as we are washed and cleansed and enter into Christ’s death and risen life; the oil of chrism used for the signing of the cross at confirmation and ordination as we repent of our own mess and commit to sharing the good news of Christ amidst the brokenness of the world; and of course, the oil for healing to confront the messy brokenness of life. 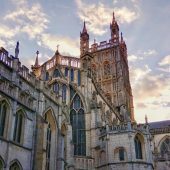 So far this week I have spent some time with men who are ex-offenders living in the community; I have been with women in prison; and I have been with vulnerable women at the Nelson Trust centre in Gloucester. In each of these places it has been a privilege to share in people’s stories amidst the messy brokenness of life. And we are of course only too aware of messy brokenness throughout our world: spilled blood and horrific mess as our Christian brothers and sisters met in Egypt to celebrate Palm Sunday; people inflicting pain on fellow human beings, whether it be Westminster, Syria or places which never even reach our headlines; And whilst children starve in Africa, families also beat a path to our food banks. Whilst world leaders are in dispute, so too are next-door neighbours. Life is messy and broken. I know that a number of you here today are struggling with messy situations in different contexts. And as a national church we continue to live with messy brokenness. That was very evident in February around the House of Bishops’ report on human sexuality and now in the ongoing conversations about the way forward. After Easter you will be receiving information about resources on the diocesan website. They are to enable conversation and the reading of scripture among people who hold different perspectives. Those conversations might be quite messy. 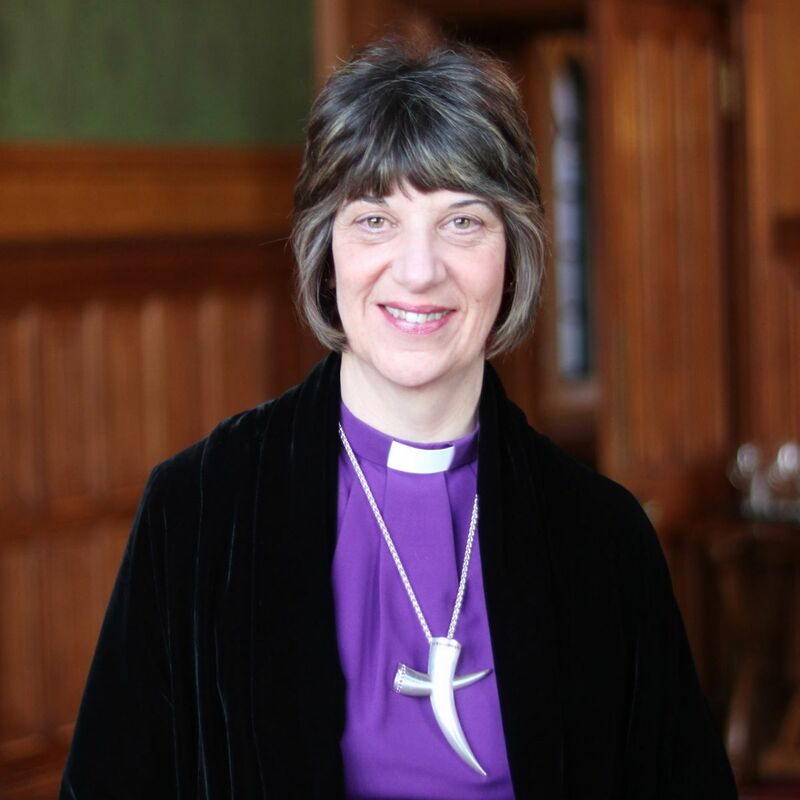 Last Friday we heard the announcement of the new Bishop of Sheffield following the withdrawal of Bishop Philip. 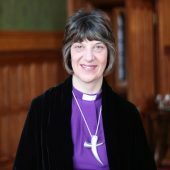 We’ve probably all heard voices of people expressing different opinions about how we live the 2014 declaration regarding Women in the Episcopate. How do we live faithfully with the 5 Guiding Principles in a way that upholds genuine mutual flourishing and reciprocity? On Sunday I was in Uphatherley with the Bishop of Ebbsfleet – we are both committed to living the strongest communion possible whilst also holding our different theological perspectives. Life can be very messy for all of us amidst our brokenness, individually and collectively. I want us to be honest about that in our life together in this diocese. I hope we will continue to go towards one another in places of difference – to engage in conversation which will sometimes be messy. Let us not forget Simon the Pharisee’s house: honest conversation, messy encounter, a deepening of relationship, and a deeper discovery of the gift of love and forgiveness and who God is. And in all of the places of our messy brokenness may we remember the oily crosses with which we have each been marked on our heads or our hands; and the oil on our hands when we have applied oil to others as we have prayed for healing or marked people with the sign of the cross at baptism. As we remember that oil we will remember that not only is our brokenness messy but so too is the redemptive work of God. Our brokenness is messy but so too is the redemptive work of God. In fact I don’t know when transformation and making all things new was ever clean and neat. You’ve only got to look outside our cathedral – the mess and disruption is only too evident but it’s all about transformation. Brokenness might be messy but so too is labour and birth. Creativity and making things new is messy business. And yet one day God’s work of restoration will be complete. As we heard in our reading from Revelation “Behold he is coming” … “the Alpha and the Omega” … “The one who was and is and is to come” – “glory and dominion” are his for ever and ever. Today as we celebrate that, the Dean will go from here to celebrate that with Bishop Michael, sure of hope and new life stronger than death. It’s the place where the mess of the world’s brokenness is met by the mess of love… The mess which gives birth to life in all its fullness. I believe the woman who anointed Jesus’ feet with oil was discovering that life in all its fullness. That life is what we want to discover and share in living our LIFE vision – I am fully aware it will not be neat and tidy. At the same time as people live aspects of the vision locally, different groups are looking at how each priority can be taken forward and be fruitful in both new and existing ways. The branches of the vine will overlap and interweave – Messy Church. Communication is crucial and everything needs to be continually rooted in prayer and relationship. Today as we come here together to renew our vows we are saying ‘yes’ to Messy Church rooted in prayer and relationship: We are saying ‘yes’ to renewing and deepening our relationship with God; We are saying ‘yes’ to our commitment to living and building relationship with and between those we serve; And we are saying ‘yes’ to our relationship with one another as the Body of Christ. Here in all our diversity we once more affirm that in Christ we are one. Those individual bottles of oil which we will take away have all come from the same oil. In this Eucharist, as in every Eucharist, we receive God’s abundant love – Christ’s broken body and shed blood – life-giving hope & love poured out. And as we receive bread and wine and are filled afresh by the Holy Spirit, may we be sent out from here to share Christ’s love and hope with others among the messy brokenness of the world. May we be broken and poured out as we celebrate the beautiful messy work of redemption and the transforming work of the Holy Spirit. In my inauguration sermon here I spoke about the Church enabling people to leave their wet footprints of baptism among the people and places of their lives Monday to Sunday. May we also leave oily handprints: cross-shaped and hopeful. Thank you for our life together. Messy Church. May God bless us as we discover and share yet more of the deep, generous and abundant life offered us in Jesus Christ.